Sister Mary Teresa McCaffrey of the Redemptoristine community residing in the Monastery of the Incarnation, Beacon, N.Y., died December 9, 2014, at age 87 after a lengthy illness. Sister Mary was born in Brooklyn, N.Y., on October 6, 1927, the first of four children of Teresa Alice Taylor and Daniel Joseph McCaffrey. She is survived by brothers Daniel and Gerard (Barbara) and sister Kathleen (John Janny), 12 nieces and nephews, their 15 children, and the eight nuns who shared vowed life with her in the Order of the Most Holy Redeemer. Sister Mary first entered religious life in 1947, joining the Congregation of the Sisters of St. Joseph of Brentwood, Long Island. After professing vows in 1949 as Sister Teresa Miriam, she was placed in charge of large classes of little boys in the parish schools of Our Lady of Perpetual Help and St. Mary, Mother of Jesus in Brooklyn. During 12 years with the Josephites, she obtained a BA from St. John’s University. Responding to a call within a call, she entered the contemplative monastic order of the Redemptoristine Nuns, located in Esopus, N.Y., in 1959. In humble obedience and with great courage, she became a novice for the second time, joining a young community creating a new monastic foundation on the grounds of Mount St. Alphonsus Redemptorist Major Seminary. There she professed solemn vows in 1961 as Sister Mary Teresa of the Holy Family. By middle age Sister Mary was enduring ever-increasing physical infirmity. Yet she remained faithful in devotion to God, her contemplative vocation, and her personal devotion to the Holy Eucharist. Always available to her community, she served as Council Secretary for numerous terms, presided over the monastery library, and gave willing ear and wise guidance to many new members. The lay associates of the monastery also benefited from her direction. On behalf of many friends and benefactors she exercised the apostolate of the pen in generous correspondence. Sister Mary rejoiced in her experience of more than 70 years association with the Redemptorist Congregation: as a child in a Redemptorist parish, a teacher in their schools, and as neighbor to their seminary in Esopus. She influenced many young boys considering the priesthood and later became friend, confidant, and informal spiritual director or prayer partner to many Redemptorist priests and brothers. Throughout her life she was a source of unity and wisdom and a model of faith and prayer. Funeral arrangements are under the direction of the Halvey Funeral Home. The community will receive visitors at the Monastery of the Incarnation, 89 Hiddenbrooke Drive, Beacon, N.Y., on Monday, December 15 from 2 to 4 p.m. and from 7 to 8:30 p.m. A vigil service will begin at 7:30pm. Mass will be offered at 11 a.m. Tuesday, December 16, in the Monastery chapel. Burial will be at Mount St. Alphonsus Cemetery. 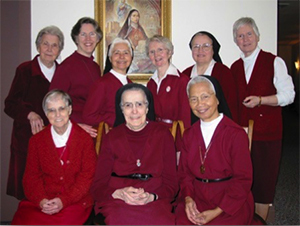 In lieu of flowers, it is suggested that donations be made to Lourdes Health Care Center, 345 Belden Hill Rd., Wilton, CT 06897, in support of their compassionate care for senior sisters.